You’re in the office, in front of your laptop, describe to me what you have on your desk or, better, let me guess: a notebook, a pen, some sticky notes, a banana, some tea bags, a hand cream (if you’re a girl), a little Darth Vader or Batman (if you’re a boy), your cup of coffee and some water to drink. Is that even close? If you live in a developed country, the glass of water on your desk or your nightstand is something common, nothing special. But if you live in a third world country, the situation would be completely different. There are about750 million people around the world who don’t have access to clean water. You know what that means? That’s 1 out of 9 people who can’t enjoy a glass of clean water after a hard working day. Not to mention the fact that a person should drink about 2l of liquids per day and the doctors recommend starting the day with a full glass of water on an empty stomach. But, besides the hydration factor, the lack of clean water leads to a lot of deaths from diseases caused by bacteria in water. The good part about it is that those diseases are preventable. That’s what Dr. Theresa Dankovich from University of Virginia was trying to do for some years – finding a way to prevent the diseases caused by bacteria in water and give clean water to those who need it most. When Dr. Dankovich met the guys at Water In Life organization, she realized there really is a way to do what she imagined. 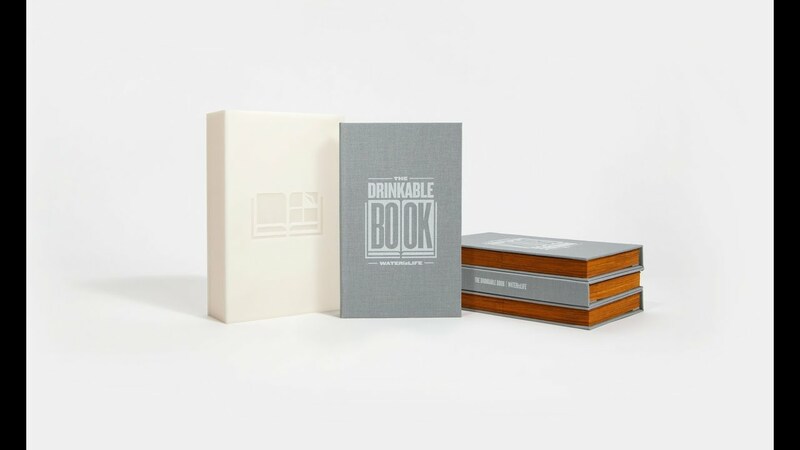 They thought about a book that can save the lives of many people, a book with special pages, The Drinkable Book. The pages of this book are coverd in silver nanoparticles (from here the orange color of the pages) that kill 99.9% of bacteria like typhoid, cholera, and E. coli – the most common bacteria that lead to deadly diseases. These pages serve as a filter and all you have to do to enjoy clean water is to follow three simple steps: first, you tear out a filter, then you slide it into the custom filter box and pour contaminated water. After that, what comes out from there, is totally safe to drink. This project has also an educational part – on the pages of this book is printed information to educate people about safe water habits, things that we, from the comfort of our office or home, take for granted (like keeping trash and feces out of water area, for example). And that’s not all! It costs only a few pennies to produce this book, it is sustainable, a filter can be used for 30 days and a book can provide someone up to four years of clean water – what could you want more? The future is here, all we have to do is allow it to be a part of our lives.